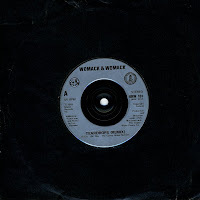 Cecil and Linda Womack released 'Teardrops' in 1988, a very radiofriendly track featuring one of the most impressive synthesizer solos in the history of pop music (not). The single was a big success in the Netherlands, where it reached number 1, but it also reached number 2 in Germany, Austria and Switzerland and number 3 in the UK. Although a picture sleeve exists for this single, I bought this sleeveless version because it was discounted at the time. I felt no need to pay more for a song I wasn't going to play for a decade, because it had been played to death on the radio.